Many see CSR very differently. This morning I woke to the comment below on one of my posts so I thought to share my response in my blog this week. I am sorry, I beg to differ from this narrative, “making CSR & Sustainability work for my business”. This narrative has damaged, rather killed the spirit of CSR. My take: “Make CSR work for mitigating the adverse impact of a company on society and the environment.” And, if a company does it honestly, transparently, and as an integral part of the business strategy, benefits in several ways are all limey to come to the business. But those benefits should be taken as ‘by-products’ of doing right and doing good. Let the ‘by-products’ be not marketed and sold as main drivers or reasons for a company to do CSR or commit to sustainability. Rather, moral, ethical as well as legal obligations under responsibility should be made more direct reasons, and they should drive companies to get into CSR/sustainability. Thanks for your respectful response. I respectfully, but vehemently disagree. Inherent in your response is the premise that the fundamental nature of business is to do harm to society and that CSR is some sort of voluntary, self-regulating mechanism by which business should mitigate that harm. I don’t agree. If the nature of a business, any business, is such that it naturally causes harm to society and environment then it should be dealt with using regulatory measures, either to ban it outright, tax it heavily, or find other means to offset that negative impact. CSR is not a repair mechanism for capitalism. Nor is it something that should be approached as a tax. CSR is a value strategy that aligns shareholder value, social impact and environmental stewardship. It creates value rather than simply distributing it. Business exists to create value; value for shareholders and, through that process, value for society. Historically many businesses, for various reasons, have missed, or ignored the second value dimension, often with little or no consequences. And regulators often didn’t (or don’t) do a good job in using regulations to mitigate adverse impacts. Over the last years we have seen rapidly rising expectations placed on business. Society and stakeholders are increasingly expecting business to create social value and be effective environmental stewards as they go about the process of creating shareholder value. Although not yet universal, there is an increasing cost and risk for businesses that do not meet these expectations. Investors are recognizing this and integrating it into investment decisions. As I’ve mentioned in a previous post, Blackrock (a $6 trillion investment firm) is divesting in organizations that are not adhering to its higher standards of social responsibility. 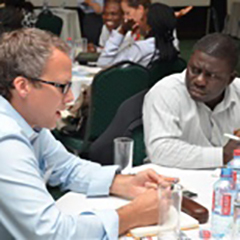 Many businesses respond to these increasing pressures and expectations by allocating resources (shareholder/business resources) to do some social good. Essentially transferring value from shareholders to society; a zero-sum distribution, a charitable and philanthropic act. Clearly, this is better than doing nothing, but not nearly as much as it could be for the business, or for society. Smart business and smart leaders are finding ways to align and integrate social impact and social value with shareholder value and business impact, making CSR and Sustainability work for their business. They are using CSR and Sustainability to create value, rather than simply distribute and transfer value. 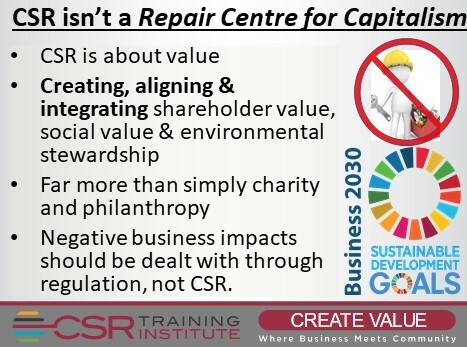 I have written often of examples of this, and will continue to write more (see https://www.csrtraininginstitute.com/insight-analysis/ and follow our Strategic CSR/SDG Video Channel http://bit.ly/Strategic-CSR to learn of specific examples. Smart leaders recognize that CSR and sustainability can create real value across all aspects of business operations. From hiring and employee retention (effective CSR can be one of your strongest recruiting assets), to finance ( see my post on Blackrock),, to marketing (value-chain impacts are increasing important from consumer markets to B2B industrial services), engineering (natural capital/natural resource process design efficiency is key to cost management, regulatory approval and social license). I could go on. The key point is that social impact and environmental stewardship do create value and competitive advantage across all aspects of business and operations. The purpose, the mission of the CSR Training Institute, the very reason I created the Institute, is to help businesses make CSR and Sustainability work for them. To develop tools, strategies, frameworks and tactics that align and integrate social value, shareholder value, environmental stewardship, SDG impact and business value. Setting them up to be supportive of each other, where more of one produces more of the others.